Below you will find an extensive collection of some of the most beautiful and captivating butterfly poems ever written. Poetry has always been a wonderful way to express beauty and create imagery with words that people can appreciate. Some of the poems are by world-renowned writers, such as British poet William Wordsworth, while our amazingly talented readers have written others. 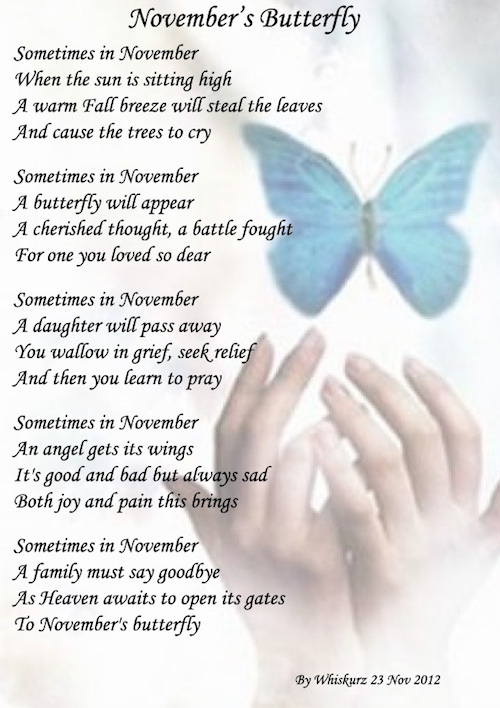 The collection includes butterfly poems for children as well as for adults; I’ve included something for everyone: inspirational butterfly poems, famous butterfly poems, butterfly love poems, butterfly poems about death, butterfly poems for kids and much more! If you would like to contribute a poem about butterflies to the collection please don’t hesitate to get in contact today. I always enjoy reading user submitted work so please do send it in. If you get selected for the website I will email you back and let you know. I look forward to receiving your submissions! 1.1 Extract from: Pagett, M.P. Author: Rudyard Kipling – British author, poet and nobel prize winner. Born in 1865 and died in 1936. Read the full poem here. They possess a certain power. that makes this warm feeling last! As it sometimes greets my hand. And yet there are some that seem full grown! As I watch as a new one stays. As they are flying low and high! As only a butterfly can! Seems like a rather quick flight. With so many wide stares. What a truly amazing sight! Viewing one worth the wait. as in my butterfly dreams. That was when I began to consume. I saw down below our precious World. Your Butterfly Angel asks of you. With your wonderfull colours, oh butterfly. Slug with home, slow slippery snail. Your annoying and scary you stinging bad wasp. Your only a fly, you giant blue bottle. Your only minute, you small little ant. Living there lives, so show them respect. Author: William Wordsworth – British poet who initiated the Romantic era of English literature. Most famous for his work, Lyrical Ballards, and his seminal poem, The Prelude. Born 7th April, 1770 and died 23rd April, 1850. O daintiest reveler of the joyous earth! A second drought would drug thee past all mirth. Author: Pavel Friedmann – Czechoslovakian poet who became famous after his death for his poem, The Butterfly, printed above. Friedmann was born on the 7th January, 1921 and died in the Nazi concentration camp, Auschwitz, on September 29th, 1944. Then the shell cracks, and the parts divide. A beautiful butterfly fluttering about. to live in joy, teach me how never to say good-bye. oh what celestial magic you do supply. you’ve cocooned my mind so I can see. Souls entwined, our infinite journey has just begun. Compass and map in his right hand. To the hills below, to seek out intruders and destroy. And rested awhile beside a tumbling, hill-bound Hungarian stream. Where blue butterflies and green aphids a-plenty played. To rid the ancient hills of strange competitors. Yet spying Map, False Heath fell instantly in love and decided to frustrate and falsify her rulers plans. Zheng`s Map was actually simply parchment. Deep and carefree sleep, stole Map away. Hillocks,yet many seek to find them. A few happy hours to sip at the flowers. He didn’t not understand and he didn’t know why. “Please, tell us, caterpillar, why are you shy? Wonder winged luminous in my eyes. On a flower who plays the sun of skies. In flight of swerve and curve amid ease? Through me as my heart awes in its choice. Sends its charm my ardor does embrace. Are bubbles leaping for bliss my eyes face. Bliss viewed from its pride glowing in flight. What muse fueled it to fill the air with light? Joy in its ripened bloom I have sought. Me glistens with colors bright abound. My survey of such is turning bold. Description is arduous to be told. To rise from seat to be nigh its charm. To induce it to float in my palm. Of experience this touch is a dream. Delectation my soul such will own. Splendid grandeur in its beam is shown. Spring of roses in my heart is grown. In its giving of joy firm to run. Who has fetched at its very best, fun. “I’ll stick my bottom to a stem. And then I’ll whisper your sweet name. A woman is like a butterfly. her beauty will be held only by a stillness and purity of heart. Grasping to hold? Or to behold? It is the pain behind glass I see. Thank you for reading these beautiful and touching butterfly poems. I hope you have enjoyed them as much as I did. Please feel free to send me your own butterfly poems if you would like to have them printed here, I am always very happy to receive submissions. Below are some of our lovely butterfly poems embedded onto images of butterflies. Feel free to submit your own creations!